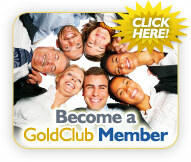 Members can cancel their Gold Club Discounts membership at anytime for any reason. If you would like to cancel your membership, please contact one of our customer service representatives and we will be more than happy to assist you. Our Customer Service office hours are from 10:00 a.m. to 6:00 p.m. EST Monday – Friday. If you are calling us when our office is closed, please leave a detailed voice mail message and one of our customer service representatives will be back in touch with you within 1 business day. Your cancellation will take effect from the time we receive an email or phone call voice mail message from you, even if you are unable to speak directly with a representative. When leaving an email or voice mail message, please remember to clearly state your name, phone #, and Member ID number. If you do not have this information, one of our customer service representatives will need to be in contact with you so we can look up this information for you. Please remember to clearly state your name and phone # so we can return your call. Thank you.